â€œI still donâ€™t have a clear picture of what the results [of the lead testing in the Expanded Assessment Areas] are,â€ said a representative of Congresswoman Lucille Roybal-Allard. 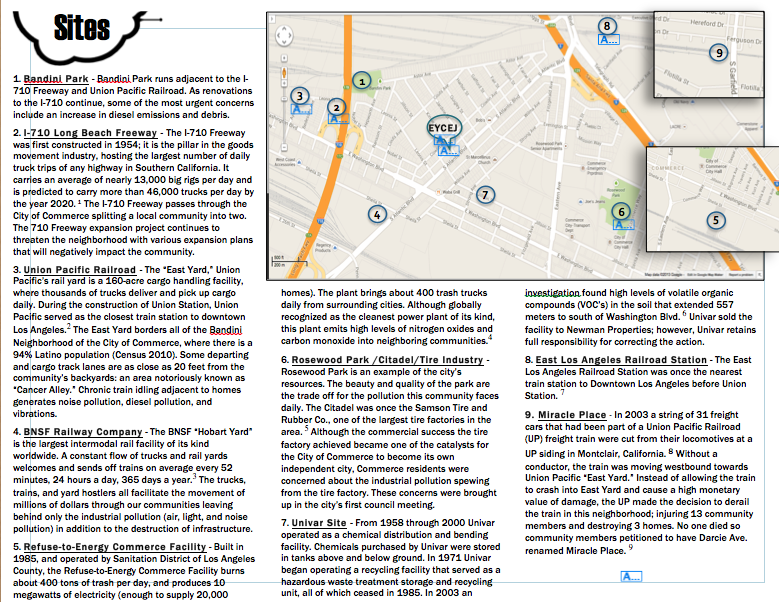 We were now nearly two hours into a community workshop explicitly intended to brief residents on the extent to whichÂ lead emissions from Exide Technologiesâ€™ secondary smelting operations may have contaminated properties found within the Expanded Assessment Areas (see explanation, at left). And a number of stakeholders had met one-on-one with representatives of the Department of Toxic Substances Control (DTSC) and L.A. County Department of Public Health (DPH) in the two hoursÂ priorÂ to the meeting to get the specific results of testing done on their property. Having tracked Exideâ€™sÂ many air quality standards violationsover the years and watched family members and friends suffer from the kinds of issues that run rampant in environmental justice (EJ) communities â€” asthma, cancer, developmental delays, etc. â€” residents were frustrated. Even asÂ they celebrated the pending closure and dismantling of the battery recycler that they had battled for so long, they were stillÂ looking for definitive answersÂ about what Exide had done to their community while it operated for 15 years under a temporary permit and with minimal oversight. But the science doesnâ€™t always comply with peopleâ€™s wishes. â€œ[DTSC] canâ€™t make sense of the data,â€ head of permitting Rizgar Ghazi acknowledged. â€œThere is no defined patternâ€ to the contamination discovered. Sampling had randomly found high levels of contamination in some spots and little of note in others, and none of it seemed to bear out in the way models would have predicted, given how far a heavy metal like lead would be likely to travel, or how contaminated almost all of the 217 properties in the original assessment areas (the green blobs below) had been. A map illustrating the hit-and-miss nature of the hot spots (above) and the graph (below) only served to illustrate that conclusion. 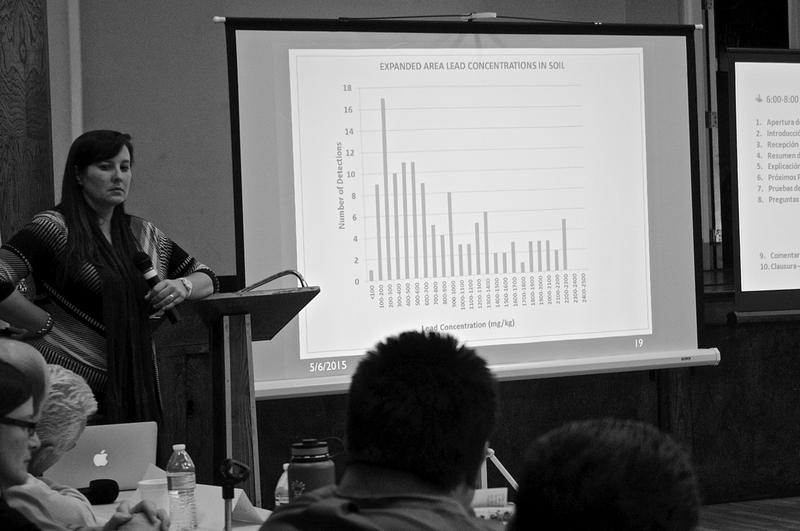 Per the graph, approximately 125 of the 8695 soil samples taken from the 146 sites tested in the Expanded Assessment areas were found to have lead levels above 100 parts per million (the State of California recommends further health screenings be undertaken at levels of 80 ppm and higher, and Exide is required to do clean-ups at such sites where there is bare soil). The lack of a pattern to the contamination poses a challenge when it comes to ascribing the blame for the problem to Exide. It is indeed clear that Exide was emitting lead into the air and water for years. 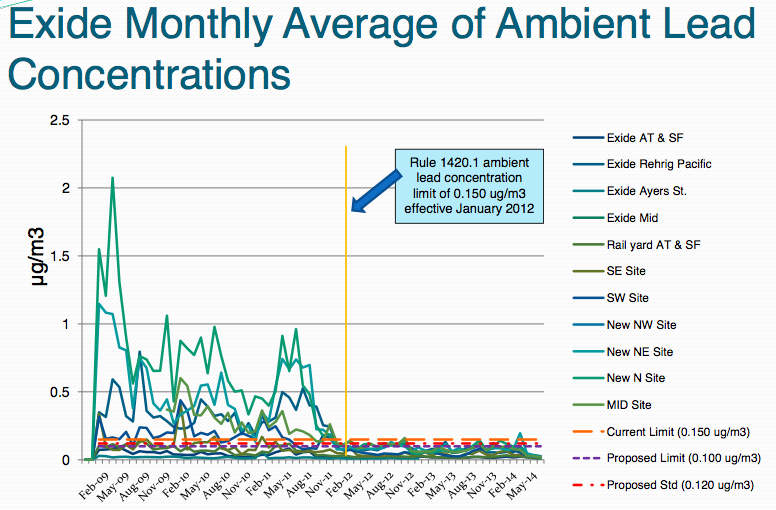 Both itsÂ long history of violationsand the graph below, marking the date that the Air Quality Management District (AQMD) instituted a stricter set of standards on emissions, illustrate that Exide could have done more to protect the environment, but consistently chose not to. And while there have been some studies done usingÂ lead isotopesÂ to determine the source of contamination, as in the case of mining disasters (see a study onÂ storks killed by toxic sludgeÂ in Parque DoÃ±ana, Spain) or around long-shut U.S. ore smelters (seeÂ an EPA study), Exideâ€™s case is more complicated. Where a primary smelter for ores processes a single source of material and leaves a unique and constant isotopic fingerprint that makes it easy to distinguish from other industrial or vehicular emissions, the secondary smelters used by Exide to extract the lead from lead-acid batteries do not rely on a uniform source of material. So, according to DTSC, there is never a specific isotopic signature. Trying to match samples to those found off-site may therefore be quite difficult, particularly as you move farther and farther away from the site of origin. Itâ€™s not easy to supplement the soil data with health data, either, as only 600 people out of the 100,000+ that are eligible for free blood-lead tests have taken advantage of the program offered by the Department of Public Health (and paid for by Exide). 1500 people also have vouchers for the tests in their hands, Dr. Cyrus Rangan of DPH said, but have yet to get tested. The locations of those current and future potential examinees have not (yet) been mapped out or held up against the soil testing data. 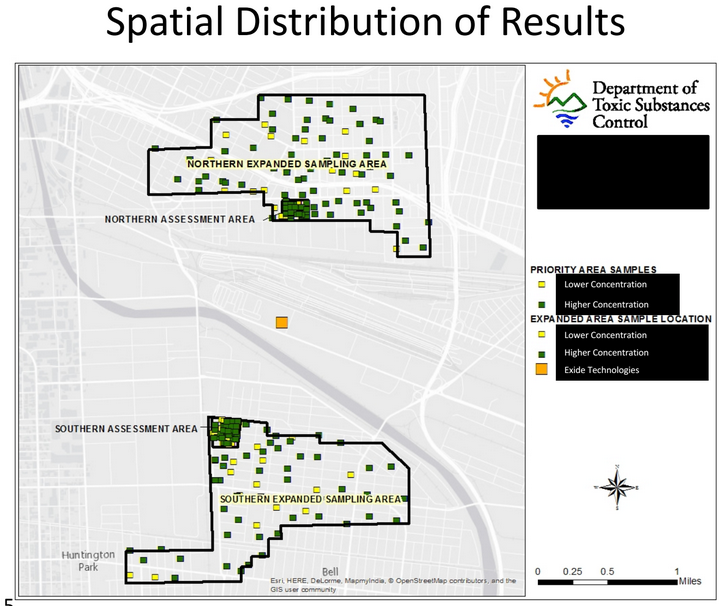 But given the massive area within which those offered free blood tests reside, the current patient sample is nowhere near representative enough to provide an accurate overview of what Exide-specific lead contamination in the area might look like. More challenging still (but a relief to hear, nonetheless) is the fact that, according to Rangan, â€œweâ€™re not seeing elevated levels of leadâ€ in those people that have been tested. Cases he did see, he said, could generally be ascribed to paint in the home (for perils on lead paint, seeÂ here). 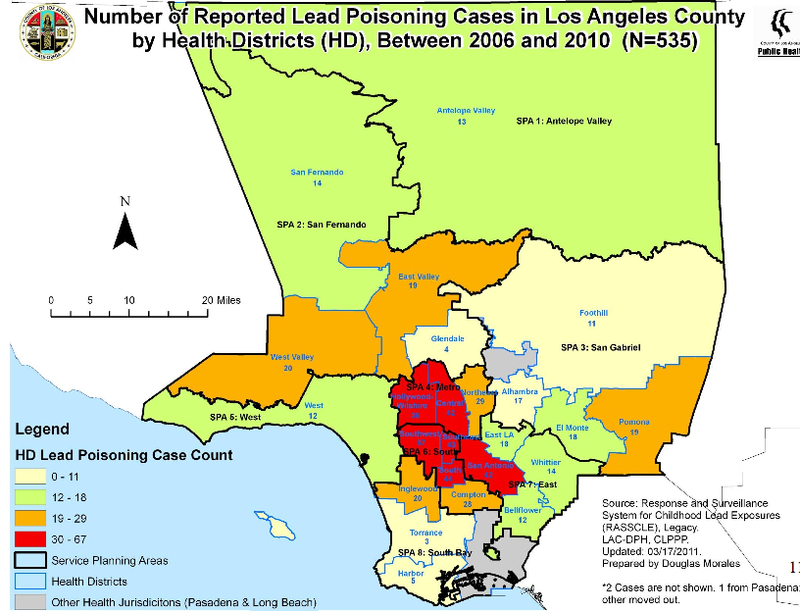 Lead paint used in the older homes there and a lack of upkeep/lead paint removal as well as the presence of a number of long-standing toxic industries in Central and Southeast L.A. all put people in those areas at greater risk for exposure. For these reasons, DTSC has directed that a subset* of the 8695 soil samples be retested and that Exide look for concurrent contaminants that could be linked to the plantâ€™s activities (cadmium, etc.) before the agency takes any next steps to design a clean-up plan. DTSCâ€™s quest for scientific clarity, however, appeared to some increasingly frustrated stakeholders to be an effort at obfuscation. Many demanded to know why their homes hadnâ€™t been tested yet. Citing a mailer sent out a few years ago by AQMD (below), they said they were told their neighborhoods were at risk and wanted to know why they were now being told that was not the case. Yes, a representative of the AQMD said, it was true â€” those mailers had been sent out. But the map referred to the potential for harm from an expanded set of potential toxins, not just lead (which is too heavy to travel that far). And, he continued, it was modeled on the projection of the kind of toxic footprint Exide would leave if it were to operate at the level it had been operating in 2013 for the next 70 years. As Exide is now beginning the process of closing,Â per a federal agreement with Department of JusticeÂ and the (expected) denial of a formal operating permit from DTSC, the projections seen in that model no longer stand. What about the city of Commerce? Why not start by casting a wider net than the expanded areas or even than the AQMDâ€™s emissions projections, and work your way back in? The questions came from Mark Lopez of East Yard Communities for Environmental Justice (EYCEJ), an organization that had long clamored for oversight over Exide. â€œAre you doing things this way because you have to justify the cost to Exide?â€ he asked, regarding DTSCâ€™s perceived reluctance to take more than baby steps in testing or go beyond their models. Lopez, who is the third generation in his family to have battled against Exide and other toxic industries in the area, says he does it â€œso that the fourth generation doesnâ€™t have to.â€ And while he was specifically concerned with Exide here, his concerns extend well beyondÂ Exideâ€™s crimesÂ to the toxins released by the other sources of pollution in the community, including several rail operators and a waste-to-energy facility. Residents in Lopezâ€™ community and surrounding areas know how rare it is for anyone to ever be held accountable for the damage done to their environments. Now that they finally have a process working in their favor, as in the case of Exide, they want to ensure that there are no lingering questions about the scope of the damage and what Exide can and cannot be held accountable for. It is a sentiment the public officials could sympathize with. Speaking about the challenges residents of EJ communities faced, Rangan said that just because they werenâ€™t finding high lead levels in the blood of tested patients, it didnâ€™t mean that the community members hadnâ€™t been exposed to toxins or that the health issues residents had complained about (cancer, asthma, developmental delays, behavioral issues, general poor health) could not be ascribed to that exposure. 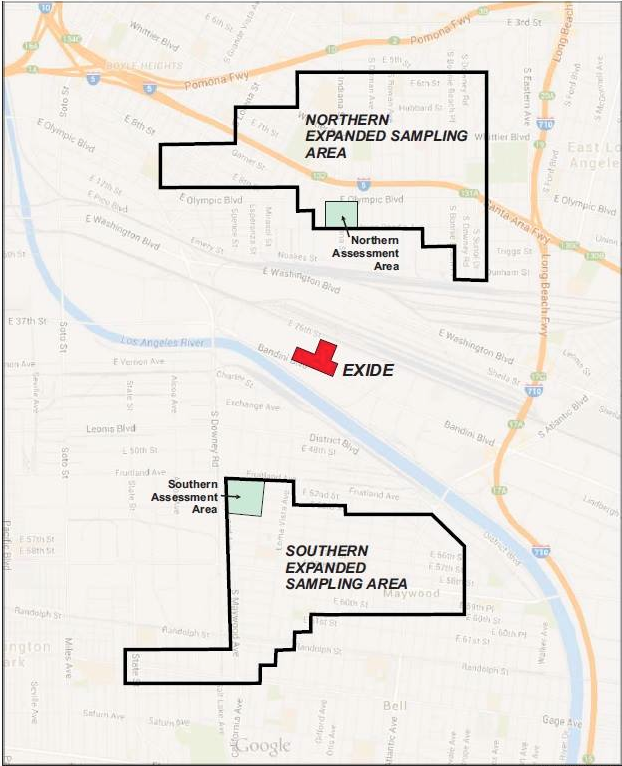 The clean-up in the original assessment areas to the north and south of Exide is continuing apace. Of the 217 properties in the assessment area, 76 have been cleaned so far. Thirty of them have yet to be tested, but DTSC reassured me they will be sending letters to those property owners notifying them of their potential liability to tenants if they do not allow the property to be tested (and, if necessary, cleaned). DTSC has promised to return to the community with answers regarding the re-testing of soil samples from the Expanded Assessment Areas and other lingering questions â€” includingÂ Vernonâ€™s closely-guarded report on Exideâ€™s contamination of the L.A. River and whether or not Barbara Lee will support a criminal investigation into DTSCâ€™s past negligence in overseeing Exideâ€™s activitiesÂ â€” when those become available. The next meeting will be held to create a Community Advisory Group onÂ May 28. 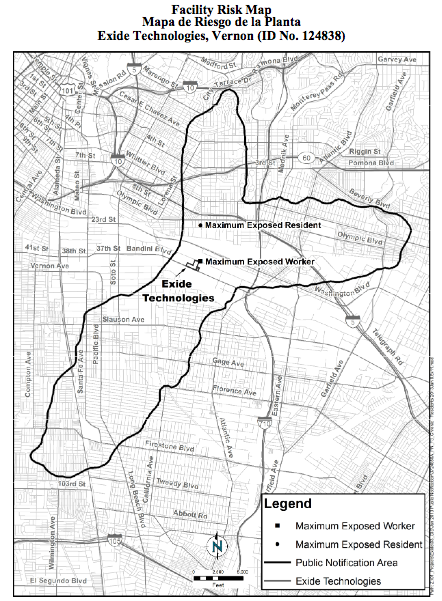 For more information on Exideâ€™s closure process, please check outÂ DTSCâ€™s dedicated pageÂ here. TheÂ AQMD also posts its ownÂ updates and weekly reportsÂ regarding Exideâ€™s closure process and any changes in the air quality whileÂ between six and eight truckloads of hazardous waste are packed up and shipped out of the facility per day.